Worshipping joyfully, praying and studying the Scriptures. Preaching God's Word with relevance and challenge. Recognising and using the gifts of God's Holy Spirit. Growing as disciples of Christ and in discerning His will. Acknowledging God's creation and our responsibility for its preservation. Including all people as recipients of God's grace and welcome in our fellowship. Caring for each other and serving the wider community. Later, Peter became the rock on which the church was built. Jesus accepted Peter’s weaknesses, and he accepts ours. We just need to acknowledge those weaknesses, and take them to Jesus. It was life-changing for Peter, and it can be life-changing for us. This is resurrection. Saturday and Sunday 18 - 19th May. 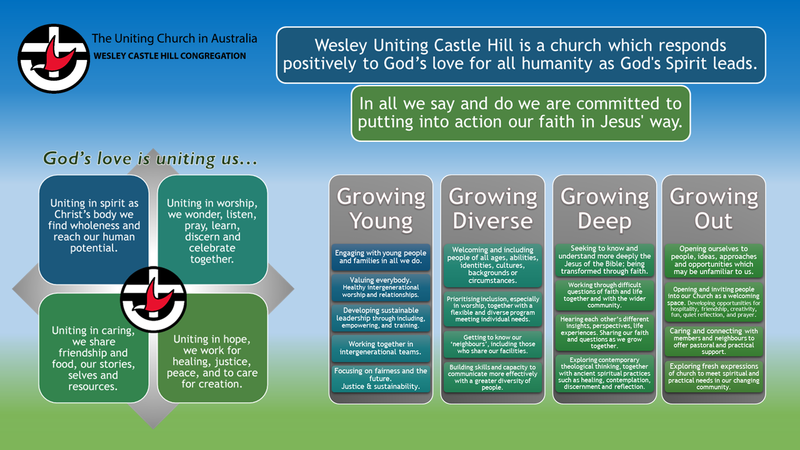 Life Teams (various times) more..
Much of our pastoral care and fellowship at Wesley takes place primarily within the context of smaller cell groups, often meeting in homes. Some of these are structured around regular small group studies or specific bible study material, while others may form around common interests. These small groups provide a safe place to form friendships and explore faith matters. Tuesdays 1 - 3pm UFO Craft Group more..
Wednesdays@Wesley 1st, 3rd and 4th Wed each month more..
Have you considered Giving Direct? There is information and a link to download a form here. Meet a Member short bio of members read more..
Members are invited to submit a short bio for Newscope in a 'Meet a Member' page. This is to help us know each other better, and make connections. You can download a Word template to complete and email or give to Annette Smith.